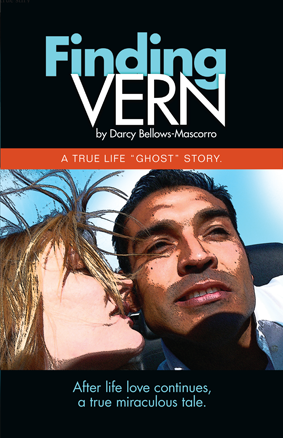 Today we are interviewing Darcy Bellows Mascorro, author of the inspirational/spiritual non-fiction book Finding Vern. Darcy Bellows Mascorro’s tells her true miraculous story for the purpose of providing hope to others. Her journey begins with the tragic loss of her beloved and leads to an amazing discovery. Not only is her beloved still by her side even after death, but her view of reality has permanently changed to understand the untapped human potential. Finding Vern is many things – an epic love story, a philosophical and spiritual journey that invites the reader to begin their own sojourn, and a revelation that life after death truly does exist in a way that few can imagine. Part memoir, part romance, and part ghost story, at its heart, Finding Vern is a call to a new way of thinking and a new way of living. Anyone dealing with loss or extreme change. Anyone interested in the mystical. People searching for meaning and have already learned the pitfalls of a solely material focus on life. You began exploring the paranormal after the loss of Vern. What was did you think of the paranormal prior to your exploration? I was never impressed by what I saw on TV. I would ridicule what they were presenting as false evidence. I came from a very skeptical point of view. And how did these views change as you did more investigation? I was presented physical evidence far exceeding what I was shown in the typical ghost or Medium TV show. For instance, we had a very clear EVP recorded in actual voice of Vern. We also have a recording of a ghost box session where the investigator asks how many people are currently in the room - the spirit answered 8, which was true. We then asked how many women are in the room and the box answered 5, which was also true. We received verification every time we did an investigation. It was insane!! Anyone witnessing walked out a believer in things we cannot see. Was there a single moment at which you saw the value of the paranormal, or were your views formed gradually? In the book I share my very first reading with a Psychic Medium it blew me away from the first few sentences she identified that I was about to be married and she saw the flowers from my wedding that would not be and then she apologized the lady/medium had a not a clue who I was looking for. Every experience for 3 years straight was completely mind blowing. I describe a a small portion of the phenomena I witnessed in the book and it is all shocking and revealing to me. I know without a doubt our conscious survives after death. This was presented to me in so many ways, not just through Mediums or synchronistic signs, but through physical manifestation and more! I am awed and humbled by what we are seemingly a part of. I realize the human potential is far greater than I ever realized or considered. Have your friends and family been supportive of your writing? Yes, at first they were worried that their grieving daughter, sister, cousin, friend, etc, was being taken advantage of by charlatans, but then they read the book and changed their outlook. They were able to put all of the evidence together that I had shared in small snippets along the way. I stopped sharing after a bit because they made me feel like I was a silly doe being take advantage of. The fact that I had a high IQ and the ability to take care of myself and others, didn’t seem to be to my credit, so I stopped sharing, but I forged ahead and I was as they say “in the flow." I hope people will be rally curious and seek answers for themselves. Seeking meaning gives their lives purpose and I hope my loss will act as a reminder to focus on what matters in life - which is LOVE. The book has a cliff hanger I am living through that now. I am finding a way to connect in a visceral way to the other side. Book two is called the Alternate String - Tapping the unlimited potential of reality. Tell us a bit about your involvement with The Lightworker’s Foundation. The group is a spiritual exploration group. I am the cofounder with Psychic Medium Michelle Tedrow. We have a list services our members offer and have donated readings and donated time on crime cases. We have taught classes at very affordable prices on topics like Developing your own intuition and Mediumship 101. We have also provided access to readings at very low prices. Someday we want to expand the vision, I’d like to see a chapter in every city, as well a healing and research center for all to come to, it will be a place for the exploration of the mystical, self meaning and healing of those in grief and need. The book is simply a real person searching for answers in a sometimes tumultuous and tragic world. It is me exposing myself and my lover. I hope most can relate to our story, and I hope it can provide hope. Maybe it can give inspiration to seek more from life and maybe clarity to things that truly matter. Though it is our story and it is a universal story of love and truth.